The only thing between you and a charming, warm living room is your imagination—and that's where we come in! 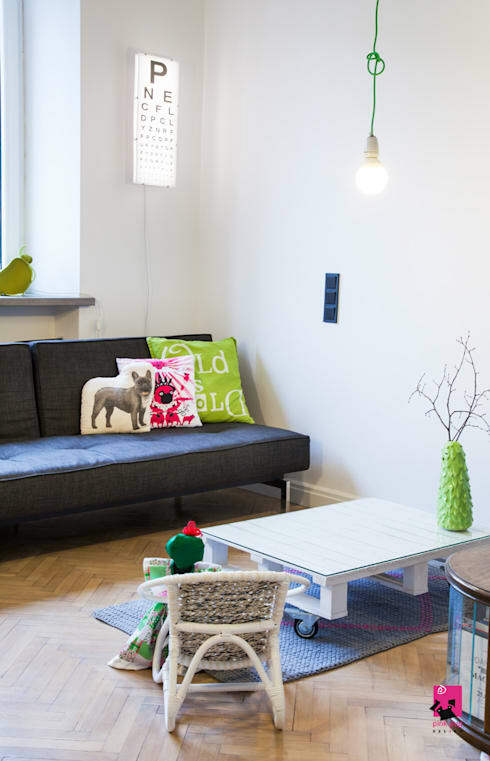 Today we'll present 16 charming living rooms that you can recreate on a budget. Some are downright luxurious, while others have a more eclectic, humble appeal. They do however require a little bit of DIY spirit. But this is a bonus because a living room interior that requires more time than money inevitably shows a bit of individuality. This is the special ingredient that makes a house a real home. So let's get on with checking out these interiors! We bet you love them. 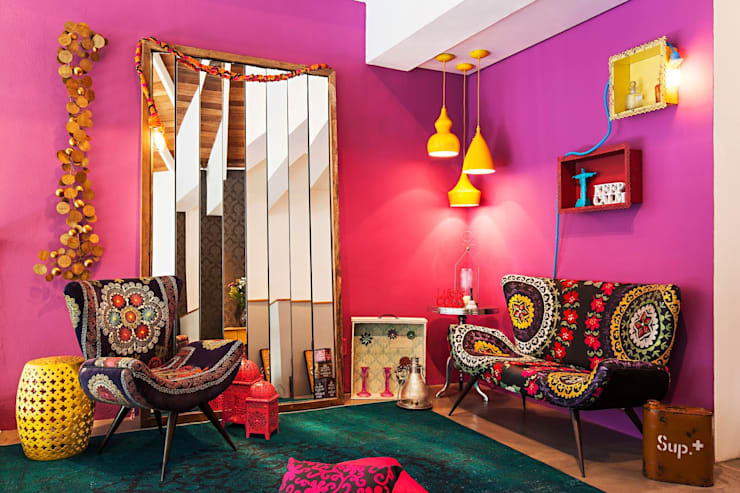 The fuschia-pink living room certainly has a lot of energy. A coat of paint is a relatively cheap investment and the most important element is the meeting point between this colour and the glossy chrome of the mirror. There is a good chance it might not be the living room of choice for the man—or woman—in your life though! This luxurious living room looks anything but cheap. However, the warmest and most welcoming elements here could be replicated quite easily and cheaply. It all comes down to the eclectic combination of framed prints. A big beautiful sheet can easily dress up the most banal wall. Here it's been used to add a lot of scale and contrast to the living room. Best of all, it can easily be removed if you are living in a rental unit. If you don't have wainscoting or fancy panels in the living room, fake them with a coat of paint. What makes this living room so special is that the wall paint perfectly matches the hue of the sofa. The special thing about this living room is the super chilled out ambiance. 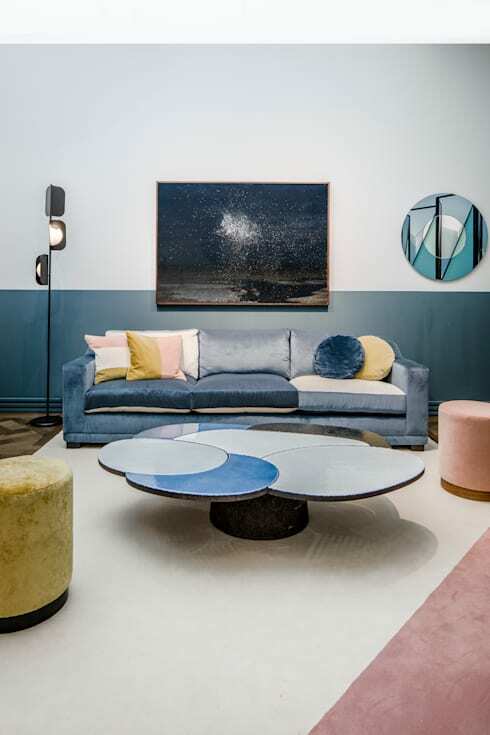 A big part of this is the unconventional sofa set-up and the colourful appeal of the vase and lush fern. 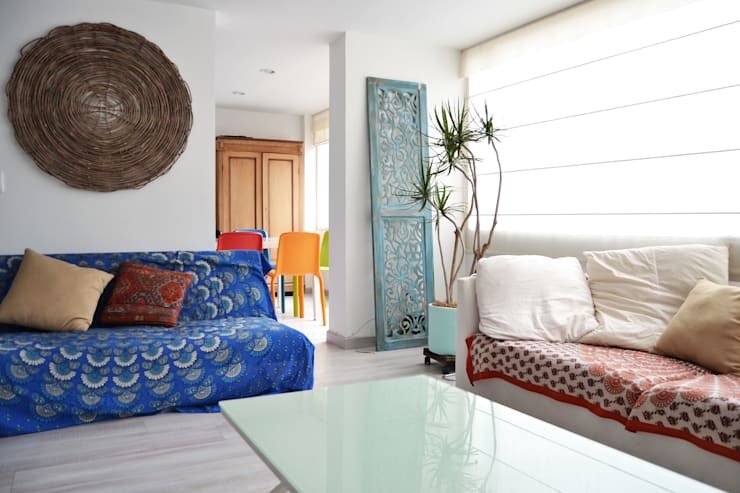 A bohemian style sofa could easily be recreated with some oversized cushions. Those with basic carpentry skills might even consider creating a platform too. 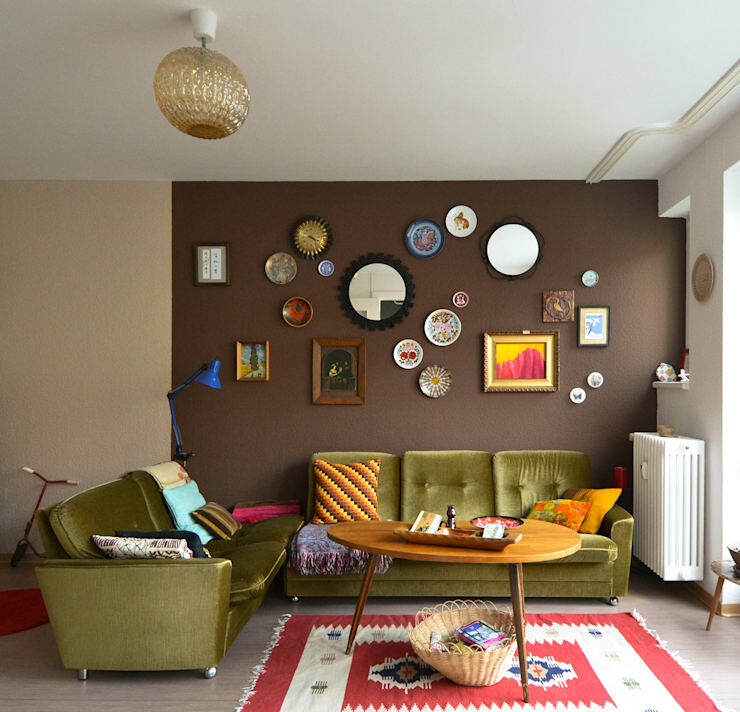 A collection of pre-loved mirrors and plates make this retro living room set-up look quite chic. The secret to making this kind of eclectic combination work is finding a common theme. Here it is the circular shape of the mirrors and plates. 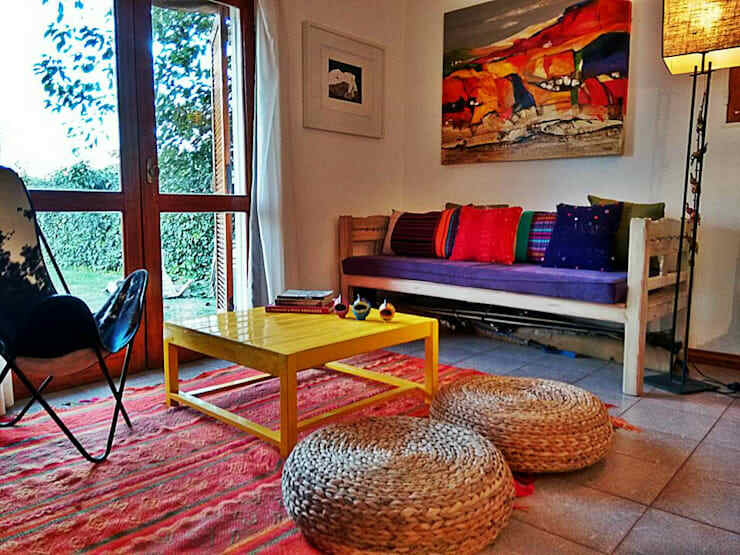 This kind of living room could be recreated with some cheap and generic sofas covered in colourful textiles. The decorative panel adds some interesting appeal. Find an old pre-loved screen and give it a fresh coat of paint. Use the items you already have on display and group them according to colour. Team them with all-white walls and you might have a fresh and vibrant living room like this. Nothing quite beats the cosy appeal of a variety of textures, materials and shapes in the living room. The floor cushions here are also a far more space and cost-efficient alternative to sofa chairs too. 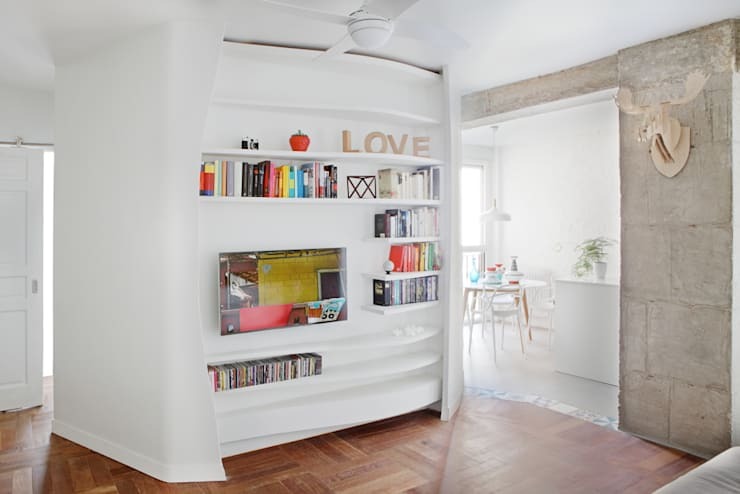 This small living room shows that size certainly doesn't matter. 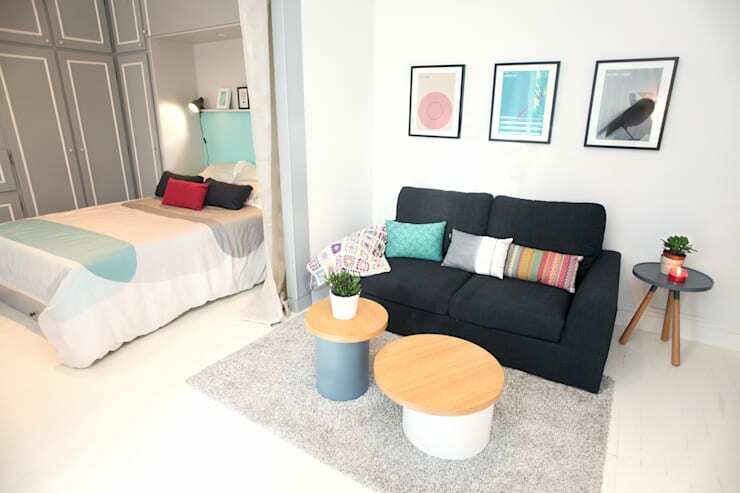 Just frame a few prints and choose colours that reflect the accent colours in the cushions. If collecting unique objects is your obsession, don't hide them away. Turn them into a feature piece in the living room without spending a cent. 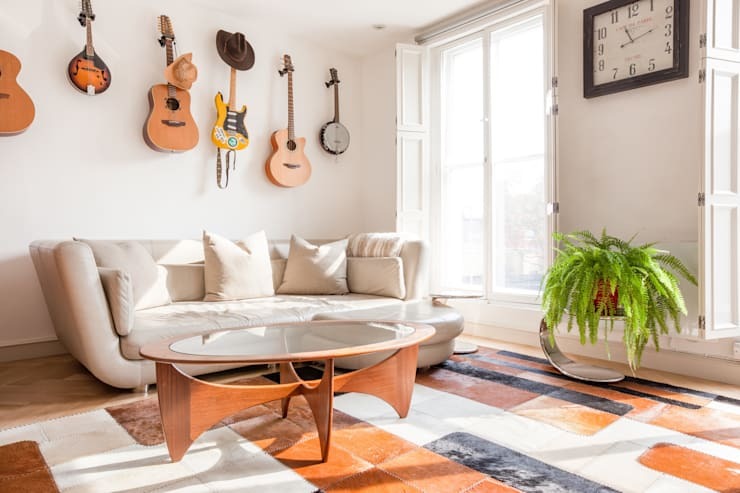 This living room has a personal collection of musical instruments lifts the design into another realm. The most random, eclectic and cheap items can look quite beautiful when set in a minimalist living room with white walls. This living room has an upcycled crate, some quirky ceramics, an antique-style bare globe and an optometrists chart. It's a look that could easily be recreated with an imaginative shopping excursion through an antique market. This living room is simply inspirational. 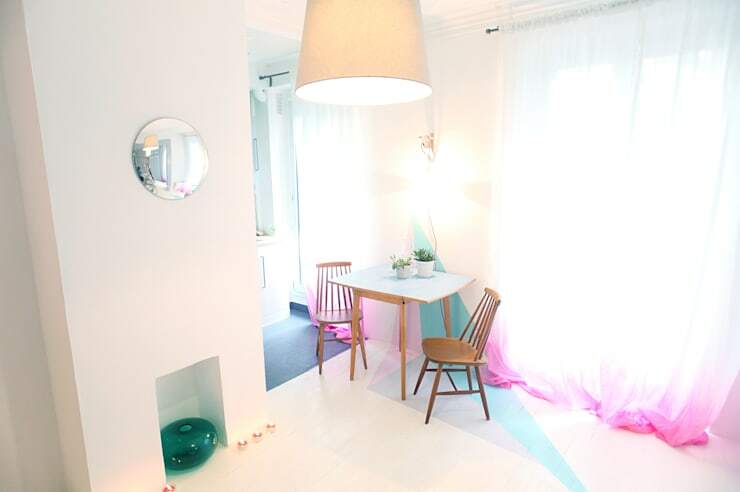 All you need is some white curtains, a jar of dye and some creative paintwork. This living room has a lot of energy for a room of limited size and few furnishings. The secret lies in the smart and bold use of colour. 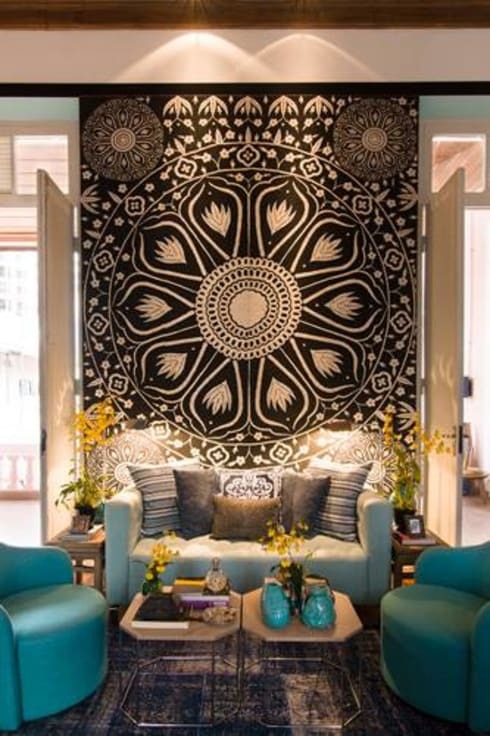 An ordinary old sofa could look great like this when set against a stencil or wall mural. You might even paint the floor. The thing about plants is that they GROW. That means you don't need to waste a whole lot of money buying a fully established small tree. 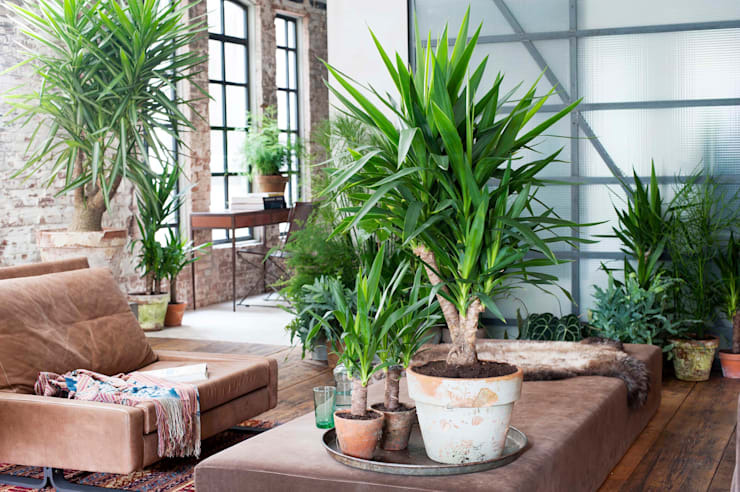 Just buy a small sapling and create a lovely jungly living room like this with a variety of species and a bit of time. 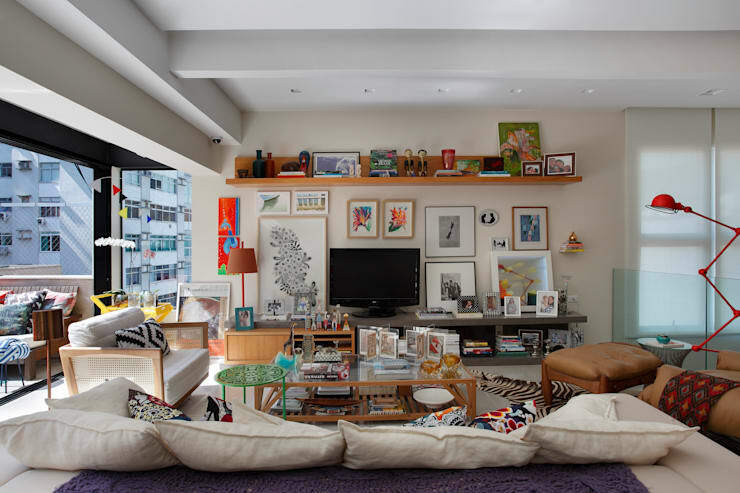 This sublime Hong Kong living room has a fairly standard set-up and neutral furniture choice in some ways. 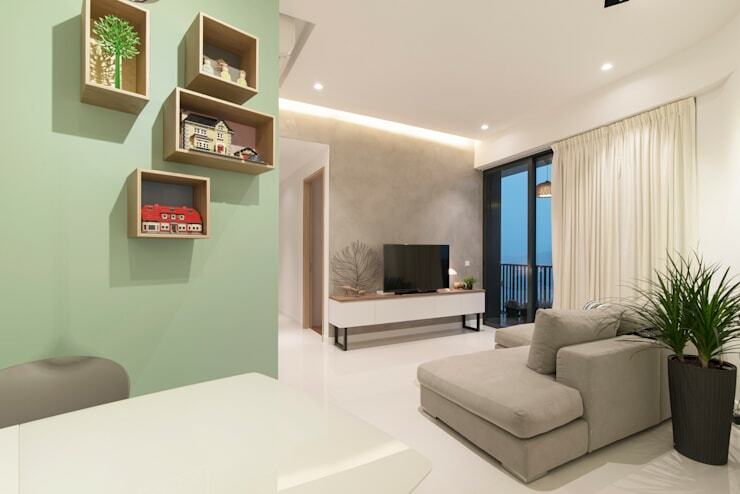 But the mute green feature wall and wall mounted wooden boxes add that extra bit of charm. This one is super easy to recreate. For more inspiring interiors, have a look at 15 brilliant staircases perfect for small homes. Which of these living rooms has you inspired?